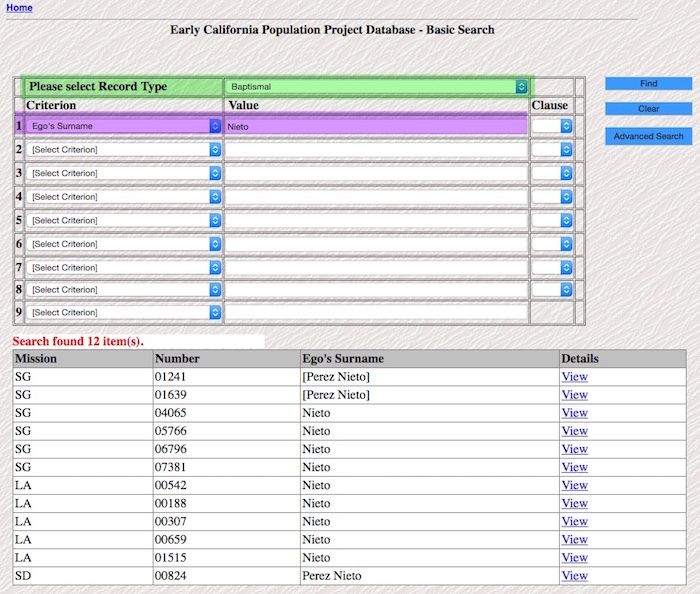 The Early California Population Project is a database holding, “all the information contained in the California mission registers from 1769 – 1850.”1 These hand-written registers are the books or folios in which mission priests recorded every baptism, marriage, and burial conducted by that particular mission. Who will you find in these records? Hispanic residents, whether born in Spain, Mexico, California, or elsewhere. Native Americans baptized and brought into the fold of the Catholic Church and the missions. Anglo-Americans who lived in California, whether previously Catholic or recently converted. Spain began colonizing present day California later than it did the other parts of the Spanish Empire that now make up the United States. St. Augustine, Florida was founded in 1565, Oñate established the first Spanish colony in New Mexico in 1598, and colonization began in Texas in 1690. Spanish soldier Gaspar de Portolá lead a land expedition that arrived in what is now San Diego, California in 1769, with the intent to colonize Alta (Upper) California. Religion played a major role in the colonizing efforts of the Spanish Empire. The Spanish Crown, like the English Crown, sought land, wealth, and other resources in the New World. But unlike the English Crown, the Spanish Crown considered it a religious mandate to accompany colonization with conversion (voluntary or coerced) to the Roman Catholic Church. Priests from the Catholic religious orders accompanied the Spanish conquistadors and explorers. Franciscan priests accompanied Portolá on that 1769 expedition, charged with establishing and administering a mission system in Alta California. A series of 21 Catholic missions were founded along the California coast between 1769 and 1823, serving as religious and military frontier outposts. Mission San Diego de Alcalá in present day San Diego was the first; Mission San Francisco Solano in present day Solano was the last. 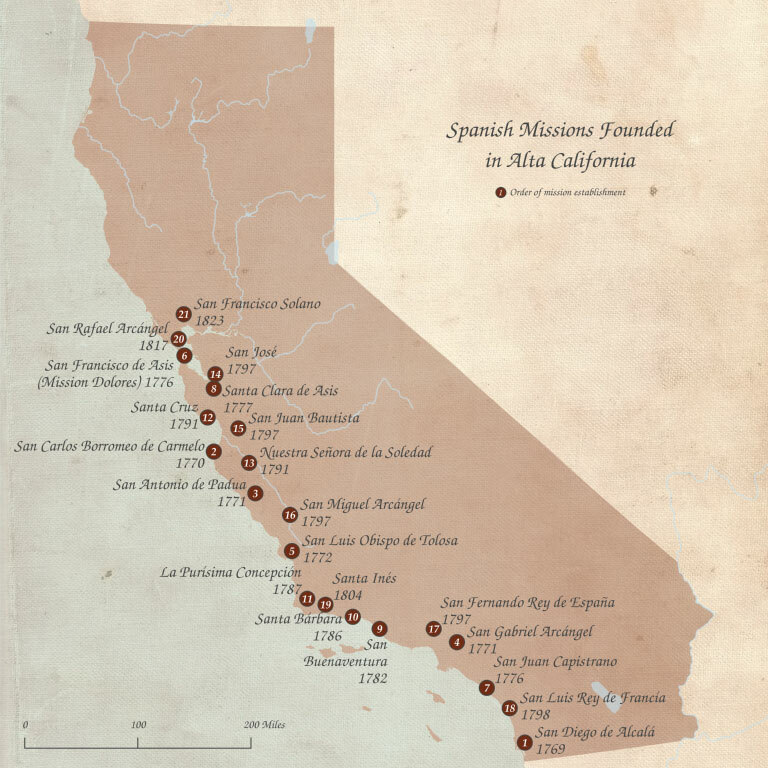 The 21 Spanish Missions in California, numbered in order of the date founded. Creative Commons licensed image by Shruti Mukhtyar via Wikimedia Commons. Shortly after Mexico obtained its independence from Spain in 1821, the Mexican Congress passed the Secularization Act of 1833. This law confiscated the majority of mission lands, breaking most of those lands up among privately held ranchos between 1834 and 1846. 1769: Mission San Diego de Alcalá (the first mission) founded. 1821: Mexico obtains independence from Spain. 1823: Mission San Francisco Solano (the last mission) founded. 1833: Mexico passes the Secularization Act. 1846-1848: Mexican American War (ended with the Treaty of Guadalupe Hidalgo). 1848: Gold discovered at Sutter’s Mill. The Early California Population Project (ECPP) is hosted and administered by the fabulous Huntington Library in San Marino, California. What about those original records? The extracted information is in Spanish, but the data field names are in English. UPDATED 5/19/18: Some digitized images ARE available, but just for the Santa Clara mission (code SCL). Look for the thumbnail images at the very bottom of the record entry. You will notice that there is no actual Search box on the website. To get to the Search interface, look for the “Go to Database” link in the sidebar menu. To access and search the database, click on the “Go to Database” link in the left navigation menu. The Search interface is very clunky and cumbersome. But the information contained in the database is gold. So just keep your eye focused on the prize while getting the hang of conducting searches. You cannot conduct a global search across all record types. You must first choose a record type (baptism, marriage, or burial) or a particular role (godparent, relative, or witness). Notice what role is absent from that list? The person receiving the sacrament. After selecting a Record Type, you may then enter up to nine different search parameters (Criterion). One very quick tip. You will see the term “Ego” as one of the many available search criteria. Ego refers to the individual receiving the sacrament. The screenshot below shows a very basic search for the baptism record for someone (the Ego) with the surname of Nieto. Top Half: The Search box with all of the various search criteria option drop-downs. 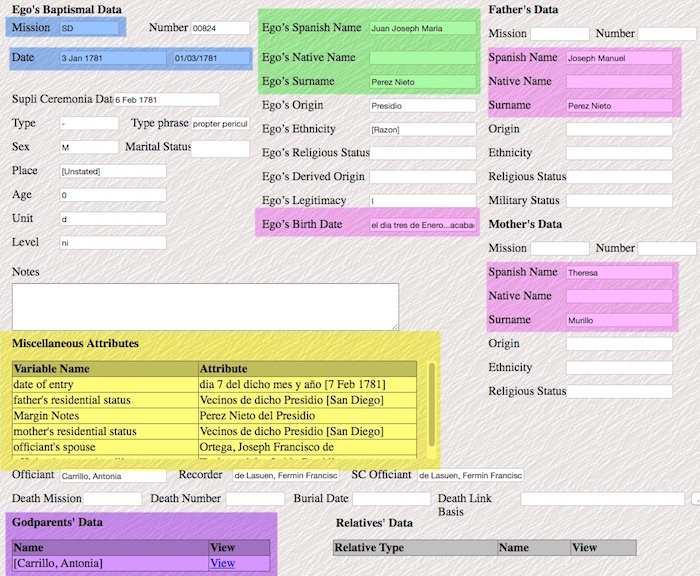 Bottom Half: Sample search results for baptism records for any individual with the surname of Nieto. First choose a Record Type (highlighted in green), then specify the search Criterion (highlighted in purple). The 1781 baptism record for Juan Joseph Maria Perez Nieto at Mission San Diego. Blue: The mission name (abbreviation) and baptism date. I forgot to highlight this in blue too, but note the “Origin” field below the green box, which indicates place of birth. This individual was born at the San Diego Presidio. Green: The individual’s given name(s) and surname(s). Given names are identified just as “name” but these records identify if that name is a Spanish or a Native American one (or both, if applicable). Pink: The individual’s birth date, father’s given name(s) and surname(s)me, and mother’s given name(s) and surname(s). Yellow: Additional miscellaneous data found in the record, including the parents’ place of residence. Purple: The name of the godparents, called “padrinos” in Spanish (see my previous post about the important role of Padrinos). So while you do not get to view digitized image copies of these records, you get a derivative version that is packed with valuable genealogical information. You can use this database to identify relevant records, individuals and families, specific dates, and the mission location, so that you can then try to hunt down the microfilmed copies of the original records, or (if the repository allows access) possibly the actual original record itself. I do highly recommend that you spend some time reviewing the help tools that can be found in the left sidebar menu. Sample Search: Pretty straight forward screenshots showing different types of searches. As I stated earlier, the search interface is clunky and not immediately intuitive. Search Tips: This documentation is long, but worth reading to gain an understanding of all the nuances involved in the many different types of search criteria available and the values you can enter in those fields. User Guide: This includes important notes about gaps in the records (missing years, missing record types, missing volumes, etc. ); the abbreviations used for each mission name; and explanations of each data field in the records, as well as how and why each value (each piece of information) was entered into each data field by the project team. Search-related help documentation is designated in blue, and the User Guide is designated in purple. Great job on this, Colleen. We have the three “Gold” books published based on this collection in our Chula Vista library. Nice to know there is an online database now. I will let our San diego Hispanic group know about your post. You did an outstanding job on this piece! You are a pro. Keep up the good work.